Provide electrification to your fence with this 1.0 joule battery energizer kit. All the tools needed to electrify your fence are supplied. Note: You will need to purchase a deep cycle battery locally. 12v DC draw: 31-90 mA/hr. With this energizer a 12v 100 ampere hour, deep cycle battery will last approximately 27 days* on a weedy fence or 80 days* on a clean fence. *Assumes being drawn down to 40% between recharges. Should power 2 miles of 3 strand cattle fence, 3/4 mile of a 5-7 strand sheep fence, 10 of the 164' sheep/goat nets and 4-5 of the 164' poultry nets. All distances are dependent on amount of grass/weed load on the fence. Use a 10-20 watt solar panel. Can be used as a solar energizer. Touch the top of the tester to the electrified fence you wish to test. Push the button (if applicable). The tester will light up according to the voltage at that location on the fence. Disconnect ground wire and fence wire from energizer. Touch the top of the tester onto the top of the fence terminal on the energizer. The tester should light up to 6000 volts or more. Insert the probe of the tester into the soil. Remove your hand from the metal portion of the probe (to avoid a shock). To get a voltage reading, touch the metal clip (on the top of the tester) to the electrified fence you wish to test. Remove the tester from the fence and the probe from the soil. Do not remove the probe by pulling the insulated wire. 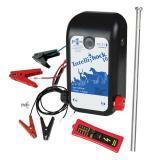 At same time touch the fence hook on tester to fence terminal on energizer. This 1 joule unit automatically adjusts battery draw down by as much as 67% if the fence isn’t touching green weeds or shorted out (e.g. 1 or 2 strand horse, cattle, anti-deer fences; also most fences during the winter or when grass is dormant). The need to recharge a battery is therefore much less in these seasons or situations. Insert battery adapter into the unit. Attach red alligator clip from the adapter to the red “+” terminal of the battery. It can be mounted either inside or outside of a building, but not where there is risk of fire. The energizer must be mounted vertically. Protect the energizer from direct rainfall. Disconnect ground wire and the fence wire. With fence tester, put the ground probe (or clamp) to the ground terminal on the energizer and the metal loop (or positive clamp) at the top of the tester to the fence/positive terminal. The reading you get tells you how well the energizer is working without any other variables. If there is a very low voltage (under 4000v) or no voltage, then the energizer may have a problem. If the voltage is high (greater than 4000v) then the trouble lies with your fence. Most energizers put out between 5000v and 8000v when there is no load (i.e. no fence hooked up). If you have a Fault Finder you can simply touch the fence with the Fault Finder at various points along the electric fence(s). The Fault Finder will tell you at each point which direction to go in to locate the problem. Move in that direction testing as you go and you will arrive at the problem. Make sure the energizer is unplugged before working on the fence or the energizer. If used with a 12v deep cycle battery, there is no case to protect the battery, so the battery will be exposed to the elements and risk of theft. 30-day warranty for all batteries. 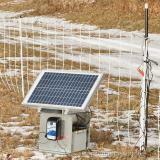 48" tall electric fence keeps in chickens, ducks, geese and other poultry while keeping their predators out. Recommended for active, flighty birds. 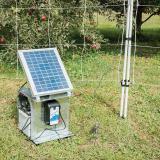 A portable electric fence designed to keep "free range" pastured pigs in. Quickly allow pigs to forage gardens, orchards and fields after harvest. I haven't had my fence charger for too long but it was very easy to set up and is working great. I really like the AC or DC option as well as the tester that it comes with. I haven't had it long, but like this fence charger. I like the small size and greater power than the one I had before. The customer service was excellent. I had questions so I phoned and got the detailed information I sought. I like that the light changes color from green to red when there is a problem with grounding out somewhere.